I had to share this with you ladies because I think I’ve found possibly THE BEST cleanser I’ve tried so far and at the cheapest price! I’ve seen this product circle a couple of the Facebook “money saving” groups and ladies are just raving about it so I thought it was my mission to put this product to the test! You can get your hands on this hot cloth Cleanser at Aldi stores but I will warn you it sells out fast. When I was on the hunt for it I went into Aldi one day to pick up some bits for dinner and there was only 1 cleanser left on the shelf! It was meant to be that I had the last one most definitely, since then I’ve managed to get my hands on another one that I’ve stored away so I’m stocked for the next few months! Apply a small amount of cleanser to dry skin and massage in to face and neck. (I make sure I’m makeup free so I usually have a shower before hand and wash my face, once I’m out and dried off I then start to cleanse). With the small muslin cloth run it under a HOT tap and wring out so it’s not dripping wet, make sure it’s still hot. Place the hot cloth over your face to open your pores and then gently polish off the cleanser. Clean your cloth and splash your face with cold water to close pores and pat dry with a towel. Let your cloth dry naturally- (I hang mine up so it stays clean and I don’t misplace it). I’ve really struggled this time round with my skin during pregnancy, at the beginning I was always breaking out and my chin and neck really suffered! Now I struggle with dry skin around my chin and nose area because I’m so paranoid at keeping my skin clean and makeup free before I go to bed my skins become very dry because of that so this cleanser has become my absolute god send and I saw immediate differences within the first week of using it. This product has become a crucial part of my skincare routine and I love it! 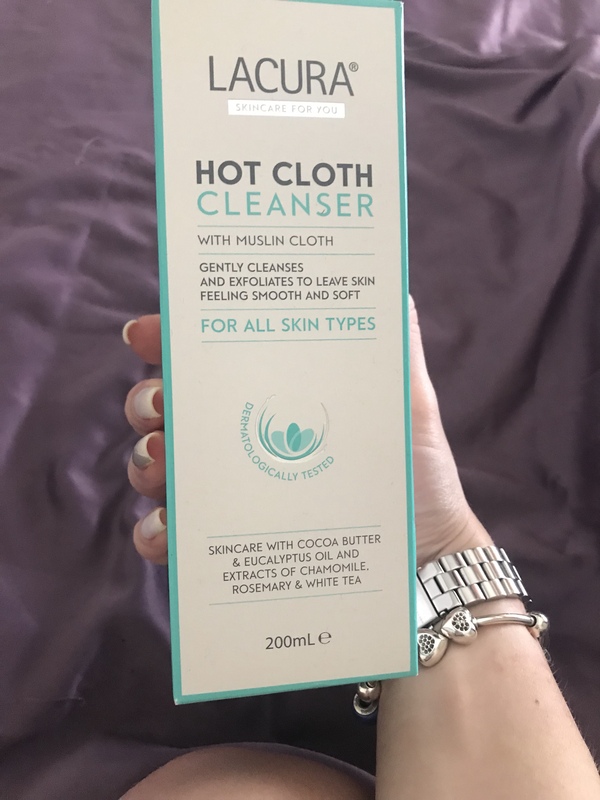 From other ladies opinions and views on this product I have noticed many have said it’s almost exactly the same as Liz Earle- Cleanse and polish kit which is retailed at £16.50 in places like John Lewis, and this LACURA hot cloth cleanser is retailed at £3.99 in Aldi! BARGAIN!! So it’s cost me £8 in total for 2 of them that’s probably going to last me 6 months- that’s half the price of just 1 of the top named brands! I’ve also got 5 skin and beauty hacks everyone should know! Click the link and give it a read for some more skincare tips!